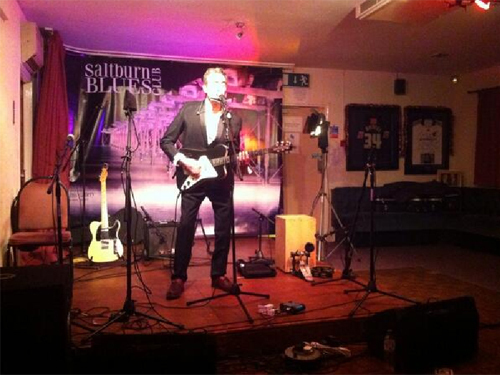 Saltburn Blues Club.. a first visit.. 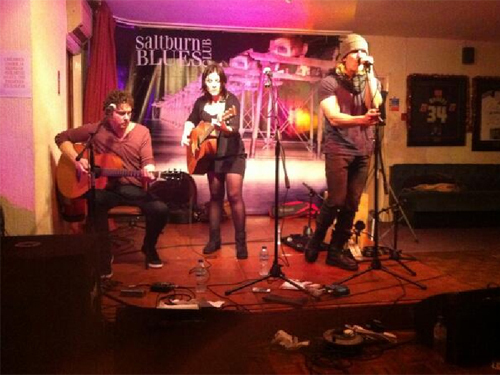 I found the Saltburn Blues Club as I was searching for a Dani Wilde gig somewhere close to home for myself and Caitlin, my eldest daughter. Leaving it a bit late to book I rang the number on the booking page and had a good and friendly chat with Harry who put some tickets aside for me to pick up on the night. Finding the venue was pretty easy, although I did manage to miss the turning because I didn’t spot the cricket club sign. If you are making a first trip here, look for the high wooden fence and the large sign for the Tennis club, turn in the side road and then turn in to the carpark on the right, the cricket club is the low building on your right. The general friendly theme continued as we picked up the tickets and found a place to sit, Caitlin picked the seats nearest the front, this being her first ‘proper’ gig (Her exposure to live music, limited to concerts in huge stadiums) she didn’t want to miss a thing. Upon heading for the bar we were greeted by Harry who gave us a warm welcome, making us feel right at home. The whole evening followed the same pattern of being nice and chilled out. Bar prices were very reasonable and a finger buffet was provided for the intermission. 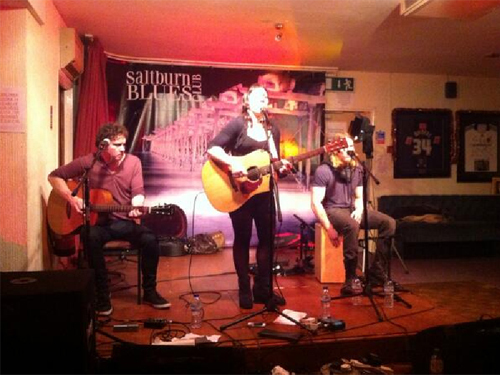 All in all it was a great evening, one which we will be repeating soon and we can whole heartedly recommend. The opening act was a singer/songwriter called Angelo Palladino. I hadn’t heard of Angelo before, but following his set, he has become a gig favourite. Angelo’s style is very much born from the British blues scene of the 60’s and 70’s, influences of bands like Free, Humble Pie and Cream shine through. Angelo made great use of the differing tones between his two electric guitars to compliment his self-penned songs which are written of life through his eyes, my favourite of the set was “Two Crows” from it’s slightly macabre beginnings a cracking song was born. With the end of Angelo’s set came a chance to refresh drinks at the bar before the main act of the evening started. On to the stage came Dani Wilde flanked by Stuart Dixon (guitar, Vocals) and Will Wilde (Harmonica, Vocals, and Percussion) who is also Dani’s brother. It’s fair to say at this point, that I like Dani’s music, I came across her whilst listening to an internet radio station which I have long since forgotten the name of and have been a fan ever since whether solo or as part of the band Girls with Guitars, but had never seen her play live. On stage Dani had Stuart seated to her right and Will seated to her left. Will was seated upon, well, a box for want of a better description. This box provided the percussion, sometimes via a bass drum peddle, sometimes just by Will’s hand. The first couple of songs were simply Dani on stage with her guitar, a fabulous way to start, proving her status a one of the great young talents in the British blues scene. She was then joined by what she terms “Her Boys”. The first thing to strike you is that they all are accomplished musicians. Stuart provided the perfect balance to Dani’s own guitar, the two trading the lead and rhythm roles whilst making the task of playing look effortless. On the other end of the line was Will, a man of many talents, to give you an idea of the skill this man possesses, at one point Will was playing harmonica, playing the bass peddle under his right foot while tapping a tambourine under his left foot at a different cadence, remarkable.. The first set came to a close with an old Eric Bibb number, Don’t let nobody drag your sprit down. Time for another visit to the bar and the arrival of the finger buffet. The second set followed the same high standard as the first picking more songs from her own back catalogue as well as new material mixed with some cover versions. The middle of this set was punctuated by Will taking over the lead vocals for an Earl Thomas number called Get me some, proving there was yet another string to his bow. Anyone with any doubt about the ability of Dani as a singer could not fail to be impressed when during the last song, Shed a little light, she came from behind the mic and as far down the hall as her guitar lead would allow and still managed to fill the whole place with her voice. For the encore Dani returned to where it all started, just her and her guitar to sing a wonderful take on the classic Love hurts. A great way to end the night. I think what came across most was that they have fun performing together, which comes across in the music. I think the three of them gained more fans, and rightly so.